FRAMINGHAM, Mass.--(BUSINESS WIRE)--Oct. 21, 2014-- Many small business owners and their employees are sitting in pain, according to a new study released by Staples (NASDAQ: SPLS) and Steelcase. The study shows that 88 percent of small business owners say office chairs impact employee productivity, yet 13 percent say their chair is so uncomfortable it prevents them from doing their job to the best of their ability. Pain is common, with 31 percent of business owners saying they often experience pain or discomfort in their lower back due to their office chair; 19 percent experience pain in their neck; and 17 percent experience pain in the mid-back. 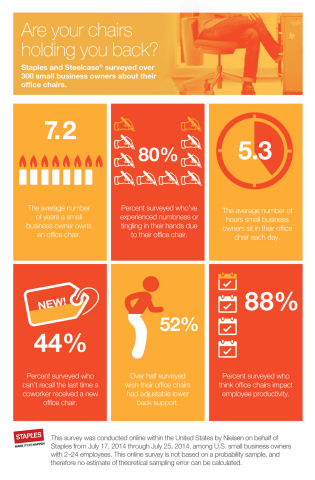 Eighty percent of respondents say their office chair has caused numbness or tingling in their hands. The average office chair is 7.2 years old, and 44% of those surveyed can’t remember the last time anyone in their office received a new office chair. On average, employees spend 5.3 hours per day sitting in their chairs. Ergonomic experts agree, workers should sit, stand and walk throughout the day. Experts recommend that a chair keep the worker oriented to their work, even when reclining. A chair should allow for adjustable height to keep both feet flat on the floor, and the worker should be able to sit in contact with the backrest at all times while the backrest supports the chosen posture, with even pressure on both the lower and upper back. For small businesses that want to support employees with a better ergonomic experience at work, Staples now offers a full portfolio of seating solutions from Steelcase (NYSE: SCS) on Staples.com. Steelcase products, including global bestsellers Leap®, cobi®, and Buoy® have been internationally recognized for their insight-led design and quality. When asked what they desire most in an office chair, over half of small business owners (52%) wish their office chair had adjustable lower back support while one-third (34%) wish it had the ability to adjust the seat height and three in ten (30%) wish it had adjustable arm rests. For over 100 years, Steelcase Inc. has helped to create great experiences – wherever work happens – for the world’s leading organizations, across industries. We demonstrate this through our family of brands – including Steelcase®, Coalesse®, Designtex®, Details®, PolyVision® and Turnstone®. Together, they offer a comprehensive portfolio of architecture, furniture and technology products and services designed to unlock human promise and support social, economic and environmental sustainability. We are globally accessible through a network of channels, including over 800 dealer locations. Steelcase is a global, industry-leading and publicly traded company with fiscal 2014 revenue of $3.0 billion. This survey was conducted online within the United States by Nielsen on behalf of Staples from July 17, 2014 through July 25, 2014 among U.S. small business owners with 2-24 employees. This online survey is not based on a probability sample and therefore no estimate of theoretical sampling error can be calculated.